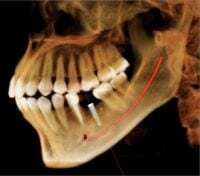 What Is An Immediate Implant? Traditionally a patient who needs a tooth removed will have the tooth removed first along with placement of a socket preservation graft. After healing for several months, the implant would then be placed and the patient would have to wait for the bone to heal to the implant. Call Naperville Oral, Maxillofacial and Implant Dentistry Phone Number 630-961-5151 to schedule your Dental Implants consultation with Drs. Blecha and Jandali. Why not always do immediate implants? To use immediate implants the health of the soft tissue and bone needs to be adequate. There is also a need to have enough residual bone volume to stabilize an implant. Certain characteristics also need to be present in the gum tissue to allow predictable implant bone and soft tissue healing. Often teeth that need to be removed have significant infection present. Some teeth that need removal have bone loss or just inadequate bone volume which makes immediate implant placement too risky. Drs. Blecha and Jandali will perform a detailed examination including a CT (computerized tomography) scan to determine if immediate implant placement is the best option in your individual case. Immediate implant placement is preferred by patients and by your restorative dentist and by Drs. Blecha and Jandali. However, long-term success is the most important goal with dental implant treatment. If we can obtain a more predictable result in a given case with delayed implant placement, we should be patient and extract the tooth and place the socket graft first. After an appropriate healing period, we can then place the implant.